Joy Neville of Ireland again makes history. 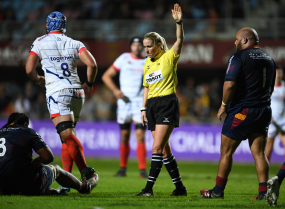 This week she is the referee in Rugby Europe's top competition, sometimes referred to as the Six Nations B, when Spain play Russia in Madrid in the first round for 2019. She is the first woman to referee at this level. Aimee Barrett-Theron will be refereeing her second Six Nations match on successive weekends - this time up in Lecce in Italy. Mathieu Raynal will also break new ground for himself as this is his first Six Nations match as a referee. By way of contrast this is Nigel Owens's 13th season as a Six Nations referee and his 77th Test match. NOLA Gold are the only team to have won two matches so far and so top the log.